A reminder that the draft will continue this Sunday 14th at the same start time of 4pm. Please be on time so that we can get the games started asap. Good luck to all teams and we'll see who comes out on top this Sunday! It is time again for another Draft Tournament! This xmas tournament will be mostly the same, and will have the same changes we made last time to include more people, and make the teams that little bit fairer. We have had very successful tournaments in the past and we are looking to improve on this with every tournament we run. The tournament is open to everyone of every skill level looking to participate in the competitive 6v6 environment. You don't need to be the best shooter or chomper - you just need to turn up to play some fun games of NS2! We would like to encourage everyone outside of the regular comp community to sign up, and for those already signed up to spread the word to others who might be interested. Open to US/SEA NS2 players! There will be an extra team grading process after the draft night for fairness. AusNS2.org Forum Signup is mandatory. Sunday 7th December 2014 and Sunday 14th December 2014. Draft Night is 4th December 6pm AEDT. Please note: this is a one week signup period, due to the proximity to Christmas time. The team with the most round wins, wins the tournament. The score and bracket for the tournament will be hosted by challonge.com. 2. If players are unavailable for the Draft Night, they must contact an Admin during the signup period or make it known publicly in the forum thread. 3.Open to Australian, New Zealand, American and South-East Asian players. 4. All teams and players are subject to shuffling and movement depending on skill and fairness as judged by the Admins in the grading process. 5. AusNS2.org Forum Signup is mandatory for contact, information delivery and rewards. 6. All other League Rules apply before, during and after matches. This post will be updated closer to the start of the tournament. Keep an eye out for more info! Week One of the AusNS2 Rising Stars has finished and we are two days into Week Two as of this post! So far, this has been an absolute blast for us to organise and we hope that you guys have enjoyed playing and spectating the matches so far! So here is the rundown of the past week for those of you that missed it! 10 matches were played this past week with 5 more to go this week. These are the matches coming up. So as you can see there are still quite a few interesting matchups waiting to happen! Intent Tummy and Pi are 1 point apart from each other at this stage, Intent, while at the top right now, only have 1 more match to play. Let's see who will get to the top and move on to the Finals! Remember, these matches will probably be casted or recorded this week. Casters tend to be more spontaneous so we will announce on the AusNS2 Twitter and in the Stream Announcements Thread here on AusNS2. Many games have already been uploaded from last week which can be found in this thread. We hope the rest of the tournament is an enjoyable one. The draft tournament will be held over two Saturdays on July 12th and 19th starting at 3PM PDT / 6PM EDT (Sundays, 8AM AEST) on both days. Expect to play for 5 to 6 hours each weekend, depending on participation. Again, these times are tentative too. If there's a more suitable time for the majority, please leave comments. This tournament will feature a round robin format. All things being equal, teams will not be seeded and each team will play each other once. The draft will be held on 7PM PDT / 10PM EDT Friday, July 11th 2014 (12PM AEST Saturday, July 12th). It will be held on the NSL Teamspeak server (IP - ensl.org). You can sign up for the draft tournament using this form here. You can view the players who have already signed up here. If you guys really enjoyed the last one from us, this looks to be like a lot of fun. Please note that matches start pretty early in the morning before you sign up! 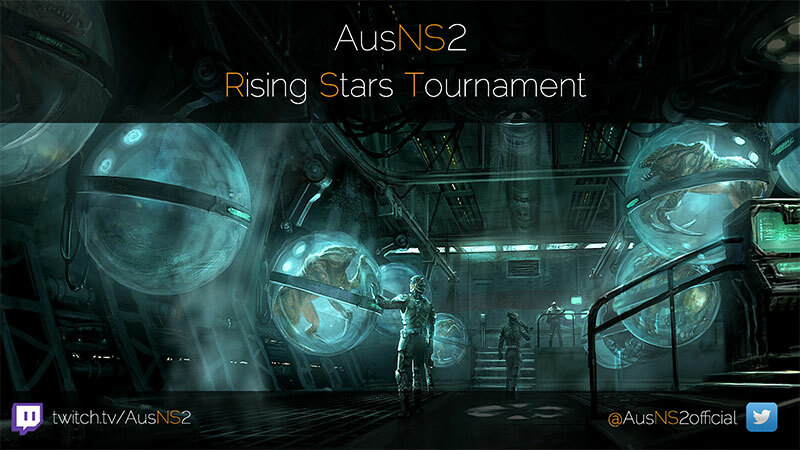 Welcome to our newest tournament – the inaugural AusNS2 Rising Stars Tournament! Also known as the AusNS2: Rise of the Tummy Tournament, this tournament is specifically aimed at allowing low tier and mid tier clans/players an arena to duke it out in. As such, no high skilled teams or players will be allowed to participate/use their aimbots in this tournament. We listened to your feedback during Season 2, and although we’re not going to create divisions for the upcoming Season 3 of the AusNS2 league, we do want to give you guys the opportunity to play in a more even official playing field. The format will be exactly the same as the Draft Tournament – round robin. After the round robin has concluded, the two teams with the most points will face off in the Tournament grand finals. **Please note: These are the default playing times. It is permissible for teams to play throughout the week at a pre-arranged time that has been confirmed by both teams and AusNS2 admins. The two teams with the most points will face off in the tournament grand finals. 2. Entry is strictly open to Australasian teams only (sorry Americans but this will be a local only tournament for now). 3. This tournament is strictly open to low and mid tier clans/teams. Any top tier teams that enter will be deemed inadmissible by the AusNS2 admins. 4. Any top tier players (as deemded by AusNS2 admins) that are entered in team rosters will be ineligible to play. As a point of reference, the top four teams from the AusNS2 Season 2 league (Envy, Hello. RaZe & The Bottom End) will be ineligible to play. Team AUS downwards are eligible. Coaching is permissible, but only from spectating. Coaches may only comment after a game (not live/during a game) for fairness purposes. Signups: Only the captain of a team/clan should sign up. Players in a clan/team do not need to sign up to the google signup doc, as captains will be signing up players in their team when they sign up. Here is the bracket for the Tournament. You can view it in full at Challonge, and I would encourage you all to refer to that page as it will be the most up to date resource for scores and ranks. Rounds 1, 2 and 3 will be played in Week 1 of the tournament. That means you have from 12:00am Sunday 20/7/14 through to 11:59pm Saturday 26/7/14 to finish your scheduled matches. Rounds 4 and 5 will be played in Week 2 of the competition. That means you have from 12:00am Sunday 27/7/14 through to 11:59pm Saturday 2/8/14 to schedule and play your matches. Captains should contact the captain of the teams they are playing to schedule matches. Please note that two maps will be played per match. A total 4 points can be scored per match, please report your scores to AusNS2 admin at the conclusion of each game, or post the score in this thread. Please note the inclusion of Kodiak. This will be played in Week 2 of the tournament. Please be dilligent about scheduling your matches. Do not leave them to the last minute. If a team fails to accept a match, then they will automatically forfeit. Please contact ausns2 admin if you are having trouble scheduling a match. If both teams fail to schedule a match, they will both forfeit & recieve a score of 0 for that match. The two teams with the most points by the end of week 2 will play a Best of 5 final on Sunday 3rd August. And so ends the June Draft Tournament. A Big thanks to everyone who played, the captains for organizing their teams, and to our lovely casters who captured all the games. We had some great rounds that were much more even this time than our previous drafts. This new format has proven to be a good formula for future drafts. We do encourage feedback, and we will take it on board when planning the next draft. For all the new players that played in the draft, we hope you enjoyed competitive ns2, and we hope you stick around to play in our future competitive events. We encourage you all to either join an existing clan by posting in the clan thread, or start a new clan yourselves. I know there are definately several new people from a variety of different skill levels wanting to join the comp scene after the draft, so we encourage you all to make yourselves known on the forums or on mumble! Speaking of which -- stay tuned, as we are about to announce our next competitive event very soon which you wont want to miss ! AusNS2.org June 2014 Draft Tournament Update! Thanks to everyone that signed up! We ended up with 90 players, this is going to be epic! Quick reminder that we are going to be using v2 of the CompMod. We still have to figure out servers because of the DZ ddos but if you run a server that we will be using, CompMod v2 needs to be installed. Here is the final team list! 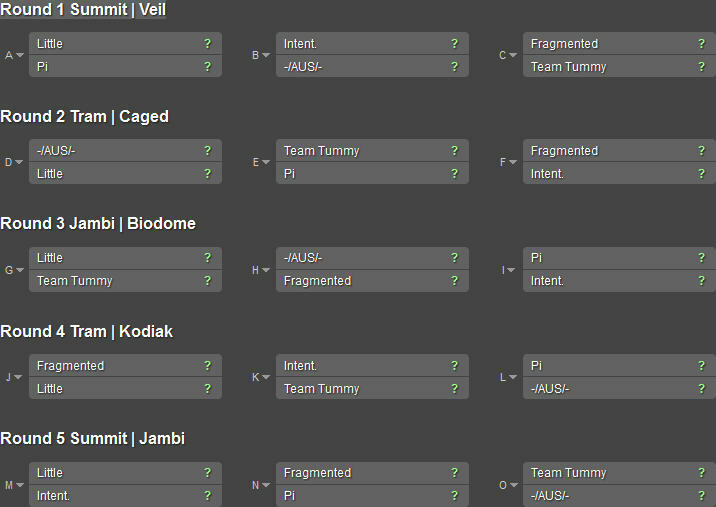 You can keep up with the scores here where the bracket is hosted and to know who you will be playing in each round!!!! This is important. At least have one look at the bracket. Remember with the international nature of this tournament and the huge amount of games that have to be played, these times are subject to being moved, changed or completely and brutally dismembered. I will hopefully be streaming as much as I can on both the Sunday's on twitch.tv/ausns2 and kid will be streaming as much as he can on his channel at twitch.tv/kidstreams! I think Ren26 will be jumping in to cast a couple games as well! It is time again for another Draft Tournament! This tournament will be mostly the same, with a few things that we are changing this time around to include more people, and make the teams that little bit fairer. We have had very successful tournaments in the past and we are looking to improve on this with every tournament we run. Now open to US/SEA NS2 players! We invite you all to tell any NS2 players, new or old, if they are interested in the competitive scene at all that this is where to start! Feel free to advertise in game to players that you think might be interested in a competition like this as there could not be a better time to get into this game! To signup for the Draft Tournament, fill out the form below and you will be added to the pool of players. On the Draft Night, team leaders will pick players from that pool and teams will be formed to play in a 2 day tournament over 2 Sundays. Teams will be reviewed by the admins for fairness based on player skill as dictated by the signup forms and our personal but objective discretion.